We’re taking the classic Rice Krispie treats recipe and mixing it up! 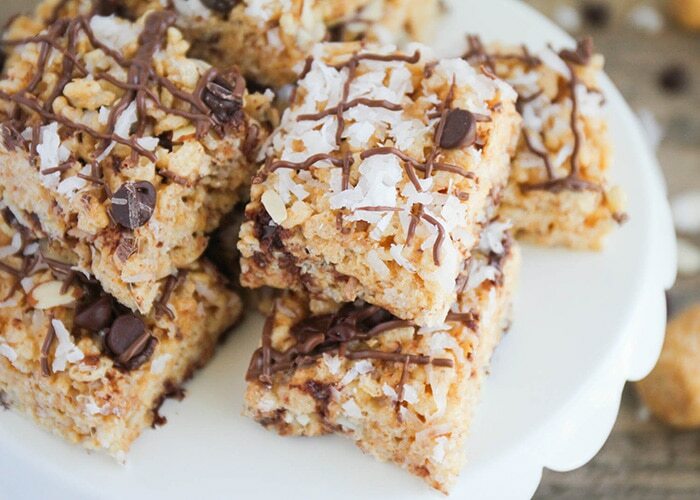 Here are 10 Rice Krispies that are not only delicious, they are also super simple to make! I met a gal the other day at work who has never had a Rice Krispie treat, like… EVER… and I really thought that was odd, because they’re just so stinkin’ delicious, and I can’t imagine a childhood (or adulthood for that matter) without ever having had a Rice Krispie treat. 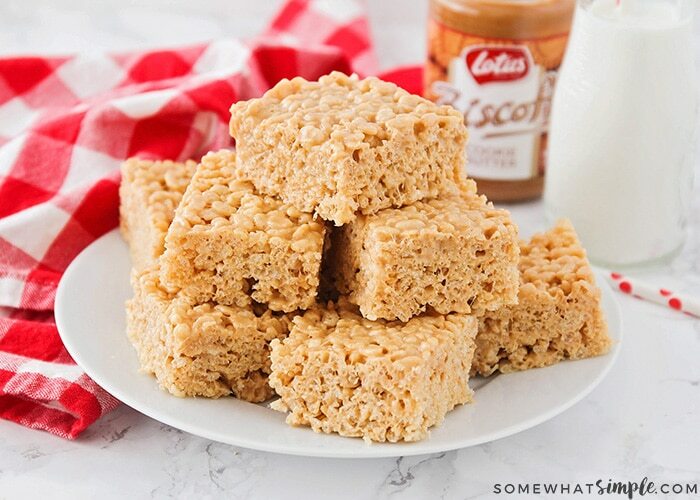 In honor of Pam, the lady who has never had one, I’ve found 10 Rice Krispie Treat Recipes that would be a great way to start your Rice Krispie Treat addiction (or continue it, in my case!) Here’s to you, Pam! Want to learn how to make Rice Krispie Treats? 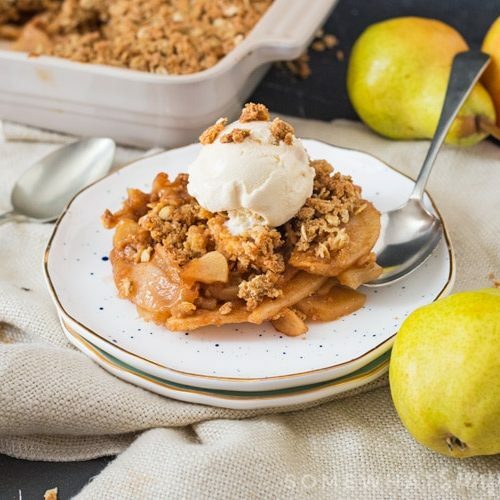 They really are one of the easiest treats to come out of your kitchen! Melt some butter in large saucepan on low heat. Add some marshmallows and stir until they are completely melted and mixed into the butter. Remove from heat. Add some Rice Krispies cereal and mix well. Press cereal / marshmallow onto the bottom of 13 x 9-inch casserole pan sprayed with cooking spray. Let it cool in the refrigerator, then cut into squares! That depends on the crispy rice cereal you use. Kellogs Rice Krispies are made from rice, which is naturally gluten-free, but they also use malt flavoring in the recipe, so the cereal itself is not gluten-free. There are a handful of other brands that make gluten-free crispy rice, so do some research and you can easily make a gluten-free version of many of the Rice Krispie recipes below. 1. This creamy rice crispy recipe just might change the way you make rice crispy treats forever!!! It is as simple as the rice crispy treat recipe you grew up on, but with one extra ingredient that makes all the difference in the world! 2. Ooey Gooey Rice Krispies use mini marshmallows + marshmallow cream. They are so good! 3. 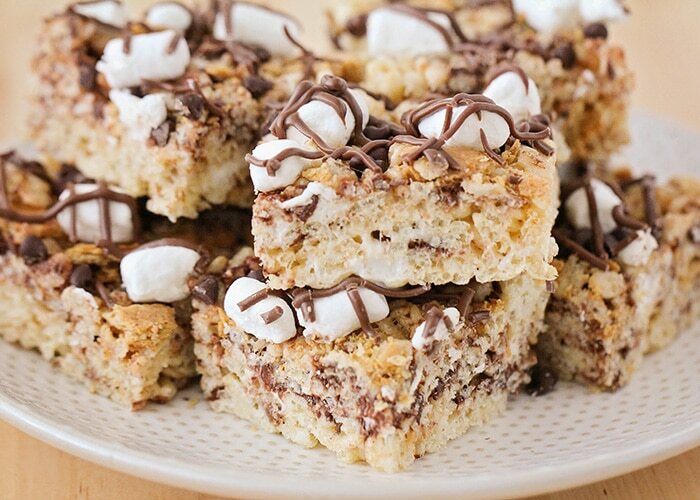 These s’mores rice krispy treats are so gooey, chocolatey, and delicious! 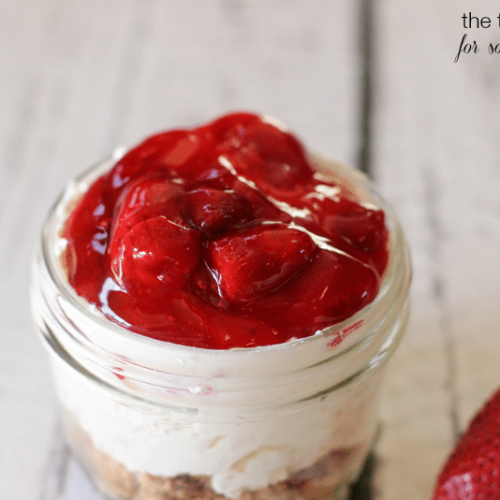 They’re easy and fun to make, and the perfect treat to indulge that sweet tooth! 4. Rice Krispies Treats on a Stick are the perfect easy-to-make goodie! 5. 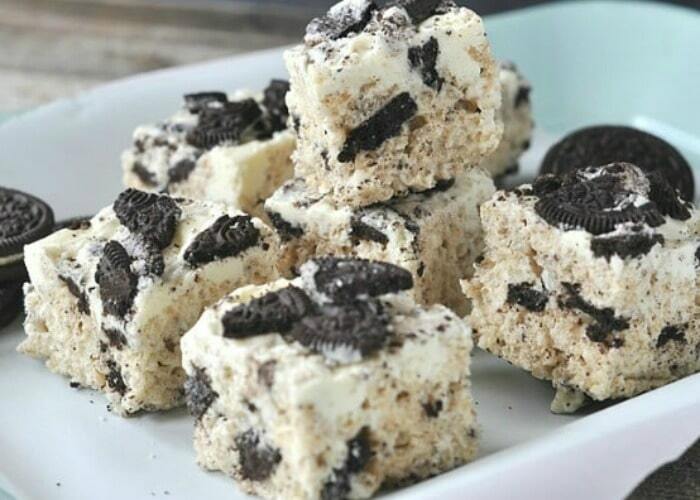 Cookies and Cream Rice Krispies are AMAZING! 6. Milky Way Rice Krispies, from Your Cup of Cake. 7. Almond Joy Rice Krispies Treats are made with coconut flavored marshmallows. And they really are perfect. 8. If you happen to be searching for the most decadent rice krispie treat you can find, then you need to try these Rainbow Drizzle Rice Krispies, from Smart Schoolhouse. 9. 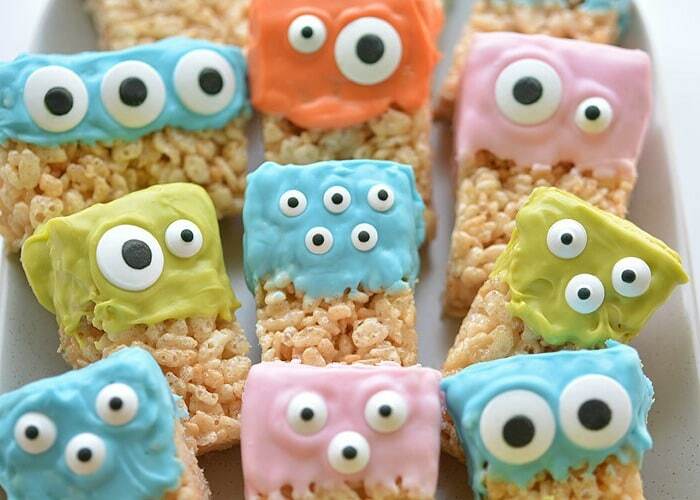 Is there anything cuter than these Monster Rice Krispies? I seriously LOVE them! 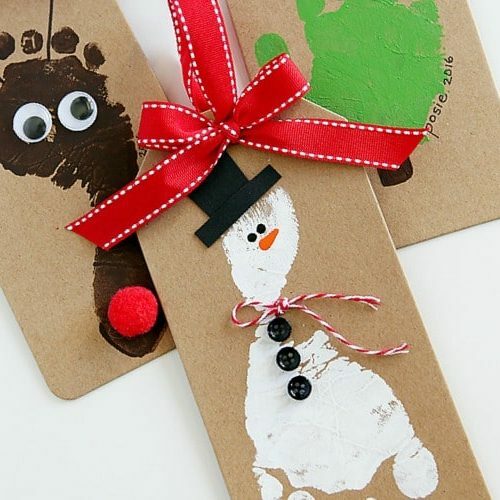 From One Little Project. 10. 3 Musketeers Rice Krispies Treats, from Something Swanky on I Heart Naptime. …and just for good measure…. Here are a few Holiday Rice Krispie Treats we think you’ll LOVE! So let’s hear it – Anyone else out there NEVER had a Rice Krispie Treat? 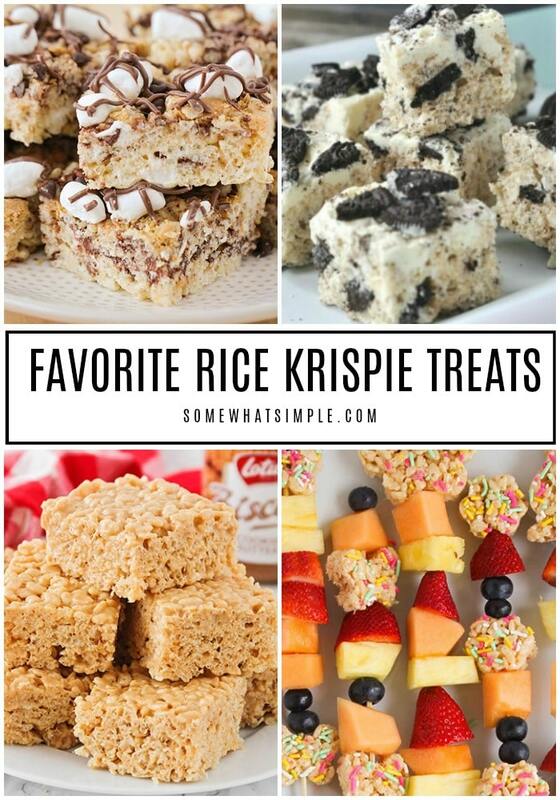 Which of these Rice Krispie Treat Recipes are you dying to try?